So I would hope by now you could gather that this week I ate Rabbit. For me, much the same as the horse really, but for many people I dare say not. Rabbits are pets aren’t they? Be it (in my opinion) pretty lame pets, which sit in a weird cage for the most part, hobble around the backyard at times and have the odd carrot (never as much as good old Bugs Bunny though, but a little). 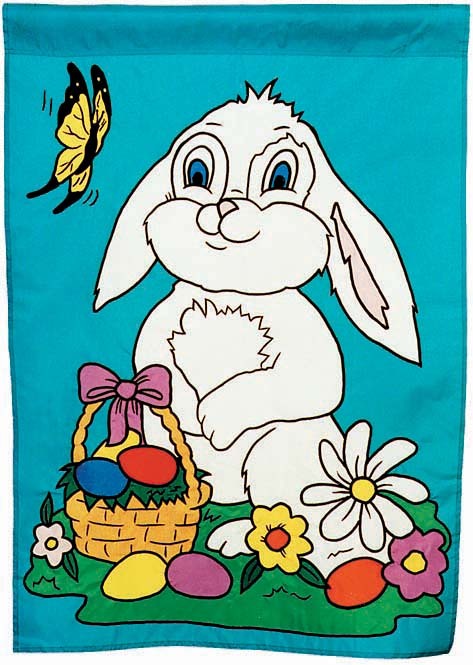 I remember at one point as a child, I was maybe 5 years old, we had a couple of rabbits as pets, Peter and Cottontail. I think they had been wild (I’ll have to confer with Dad on this). I don’t think they lasted long at 279 Kingsbury Ave, Rangiora. I seem to recall a trip to the river to ’let them free’. No doubt they were eating Dad’s veggie garden and leaving their business on the carpet. Lucky little buggars got a sweet release; as opposed to the possible cat’s dinner option which was no doubt a looming threat. All this being said the whole pet thing doesn’t really seem to enter into the equation much when it comes to eating rabbit. 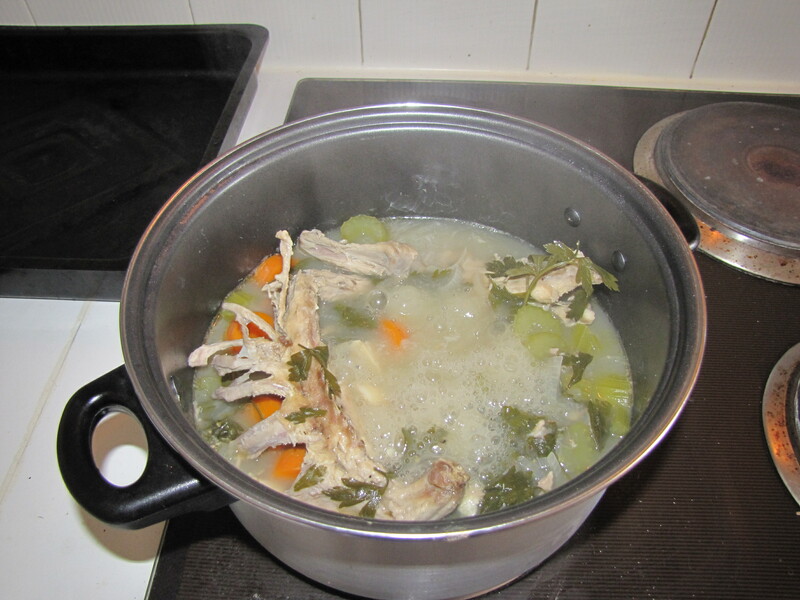 It’s pretty common place, especially as a stew, I believe probably more so a country thing, but nonetheless common. I have never eaten rabbit before I don’t think. I have never eaten a few of the things I’ve had so far this year throughout this challenge, as well as other occasions. 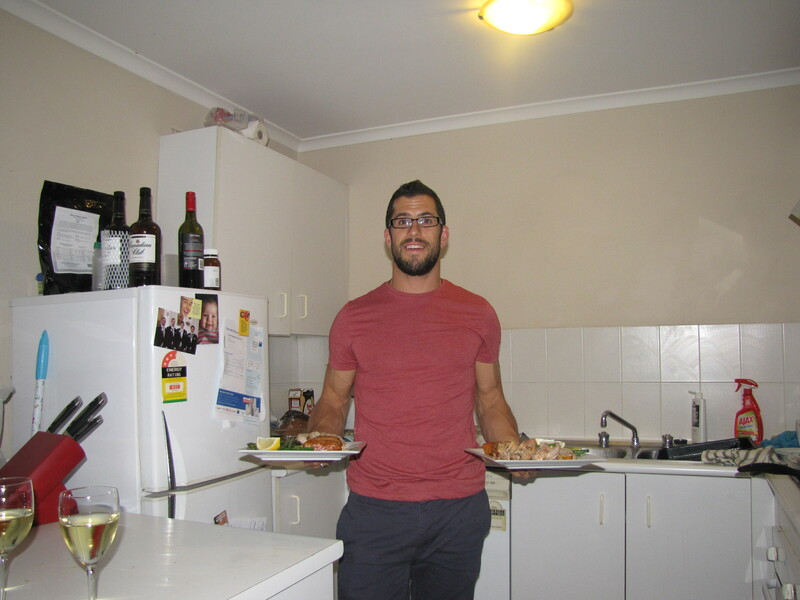 Earlier this week I was treated to a fantastic dinner by one of my clients. We went to a local Japanese restaurant we had discussed a few times, and which I had yet to dine at. I’ve tried very little Sashimi in my time, and I’ve already discussed on this blog my general lack of experience when it comes to things from the sea, so this was pretty new for me. I put myself in the hands of an expert. Hide (pronounced Hee-Day), is from Tokyo and a lover of food, especially sashimi, so he ordered everything for us. I think I managed a total of 6 new things tried, including such things as eel and sea urchin. Overall it was beautiful, and I’m very glad I’ve branched out and tried it, which I will definitely be doing more of in the future, some of which as a part of this challenge and blog. A big thank you to Hide! I currently sit on my balcony, taking in the events of yesterday and the week passed including the raw seafood fest. 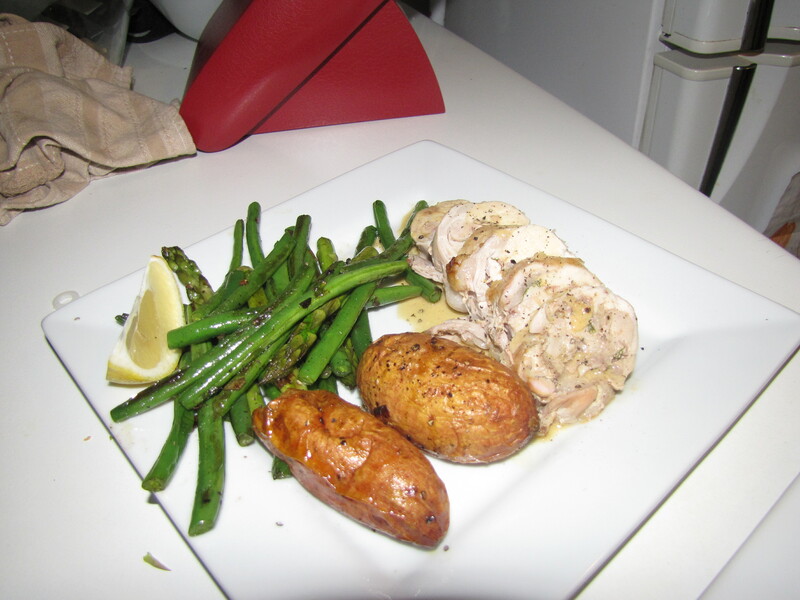 I have a belly full of the leftovers from this week’s meat challenge meal. Upon reflection on the way this year is panning out, I feel quite happy that I am pushing through with this challenge each week and I know that this is leading onto many new things and experiences. I said at the inception (nothing to do with Leonardo Dicaprio) of this that I like to try new things these days, and I am certainly living up to that. I’m sure there will soon be some things that push my limits and commitment, such as some Lambs Testes perhaps. I am practicing what I preach. I think this is something I generally do when it comes to training, health and lifestyle. I train regularly and appropriately for the occasion. That means hard work and pushing my limits, then easing off and doing the lighter, remedial stuff and resting when needed. I eat well, pay close attention to my diet and supplementation; I do a fair amount of research on many topics in these areas and keep up to date with the latest and best practices. I get enough good quality sleep and I relax and have a few beers when appropriate. In fact I’ll be leaving this writing shortly to have a few with a mate for his stag do, poor guy! I like to think I have a pretty good balance and therefore I look the part of a good trainer, someone who knows what they’re talking about and I’m 3D living proof. So one thing I am baffled by is trainers who definitely do not look the part. By this I mean trainers that look they should be a contestant on The Fattest Loser (is that what it’s called?? ), or be paying me money to get them in shape, sort their diets out and get them training properly. I can’t believe the state of some trainers who look more like turtles than athletes. How can you expect someone to pay you money to help change and improve their health and bodies when you look like you’d be better suited sitting in the driver’s seat of a taxi? (Slight gripe with taxi drivers at the moment…). 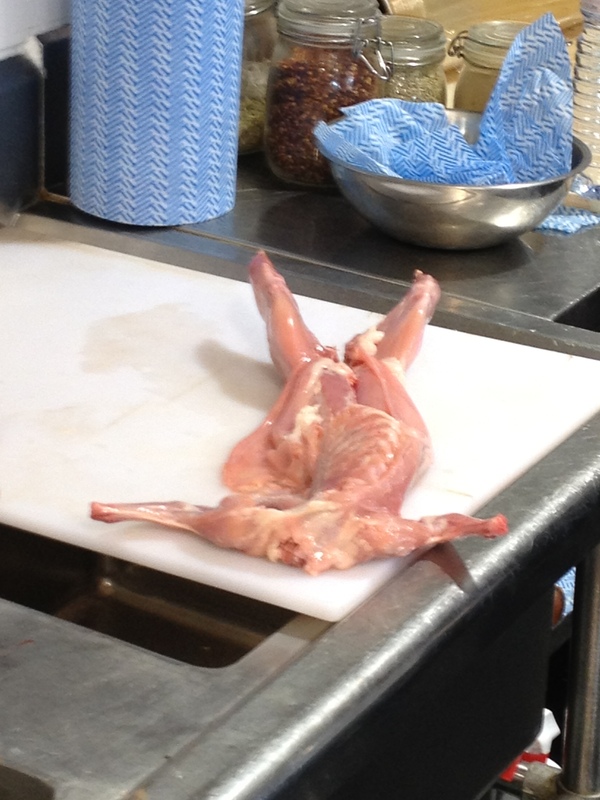 Anyway, this week’s meat wasn’t just some Rabbit, it was a Whole White Rabbit. 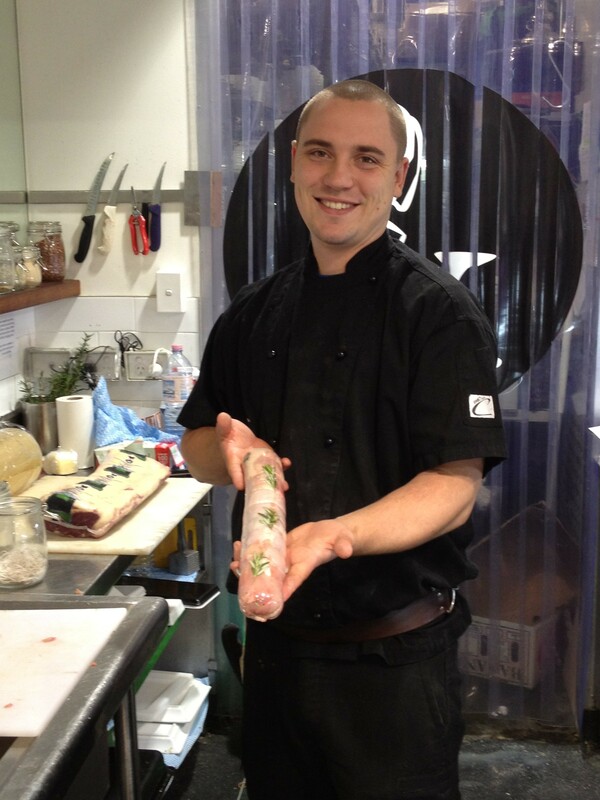 One that Tom from The Butcher and the Chef kindly and ever so expertly de-boned for me as I keenly looked on. This was a pretty cool thing to witness (the little bunny didn’t stand a chance of keeping its skeleton). I now have it, and it’s currently making a lovely stock as I type (got to make use of every part!). I was in meat lovers, butcher heaven, constantly snapping photos as Tom and I chatted and he told me stories about rabbits. 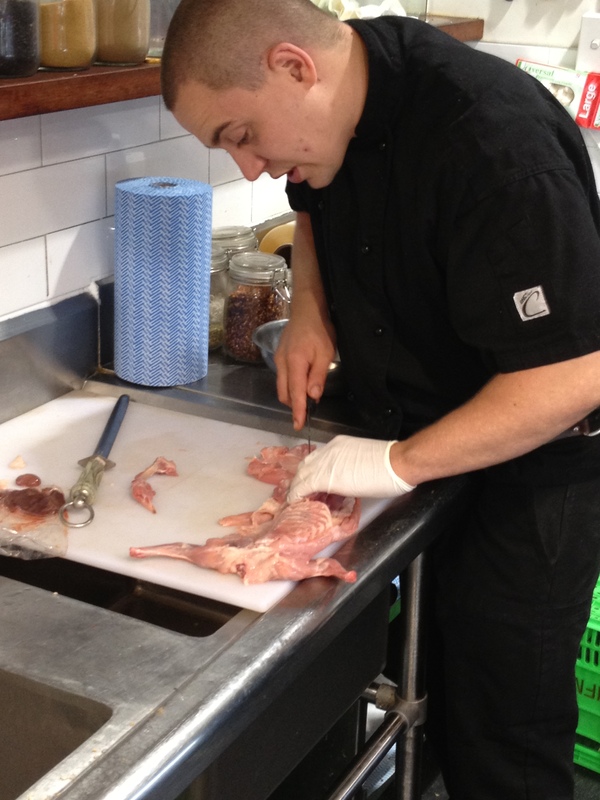 For example, in France (Tom’s mother is French), butchers used to have to sell rabbits with the heads on as some sneaky blighters had been killing off cats and hocking them off as much more sought after rabbits. This prompted a nursery rhyme style song about it (sang with a French accent: “make sure your rabbits have their heads…”, or words to that effect). Cat’s taste no good hey? On my arrival at the butchers Tom proceeded to tell me a few recipe ideas and the one that hit home was the de-boned number, which I was hoping he would offer to do and he did, ideal! 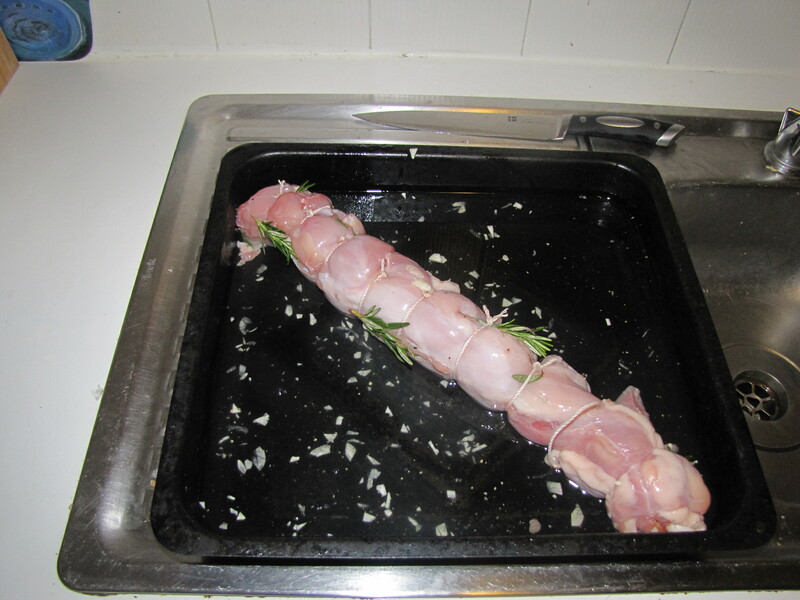 So once he had completed his master piece he lay the little guy out and put some Pancetta and fresh rosemary through the middle, rolled it together and tied with string. I was excited, so was he! The anticipation of eating something new was amplified by the creation I had just witnessed! I left with the promise of Tom’s picture and artistry being a part of this week’s blog. I had the delicious rolled meat in hand, the skeleton in one bag and its teeny kidneys and liver in another, with the advice to sauté quickly with onions (my nemesis) and have as an entree. DONE. Well apart from the onions, I, ah… ‘forgot’ to buy the onion. 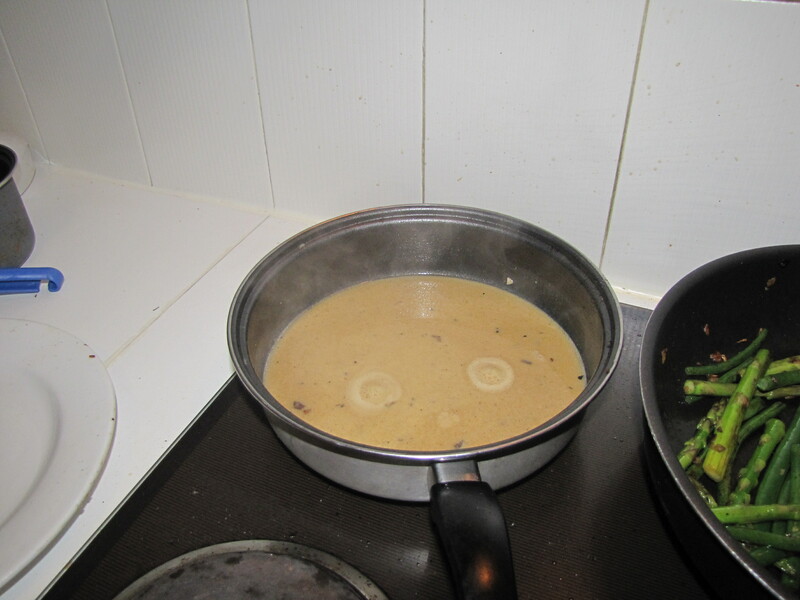 I had a quick look online for some pointers on the offal, funnily enough onions was the suggestions, but my aversion to onions remained and instead I heated some butter and added the garlic before quickly frying up the kidneys and roughly diced liver. They made for a very tasty little entree for me and my partner in crime. I can’t see them making a regular appearance purely because of the rarity of sourcing them, but if Tom has more in I’d jump at them for a lovely dietary alternative. 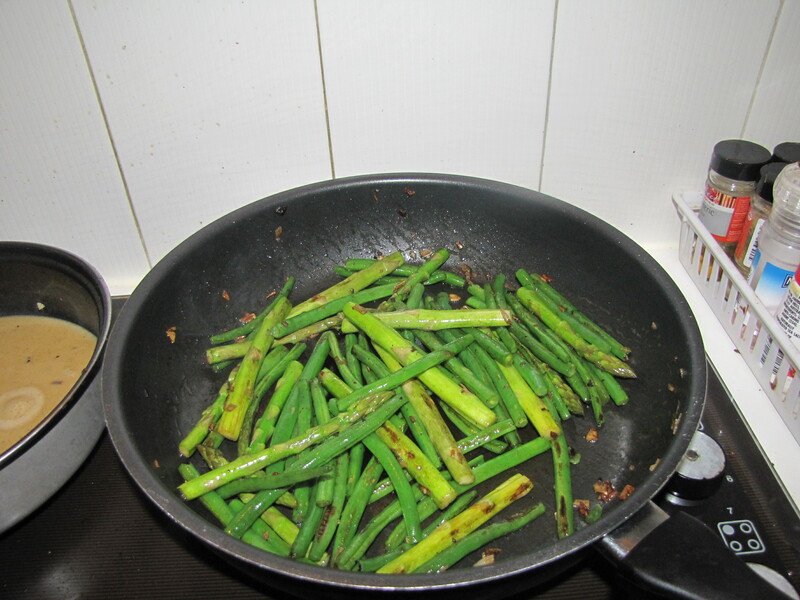 I roasted the kumara and sautéed the beans and asparagus close to serving time. The meat was in the oven for 40 minutes and once removed it looked divine. The remnants of the wine and meat juice had some fresh cream and Dijon mustard added and reduced down to a delicious sauce, or to sound unnecessarily pretentious but somewhat French, a jus. I sliced the rabbit, dished it up, took the obligatory photos and sat down to enjoy the fruits of my days viewing, learning and cooking. I have to say it again, this was (in keeping with the French theme) très magnifique. 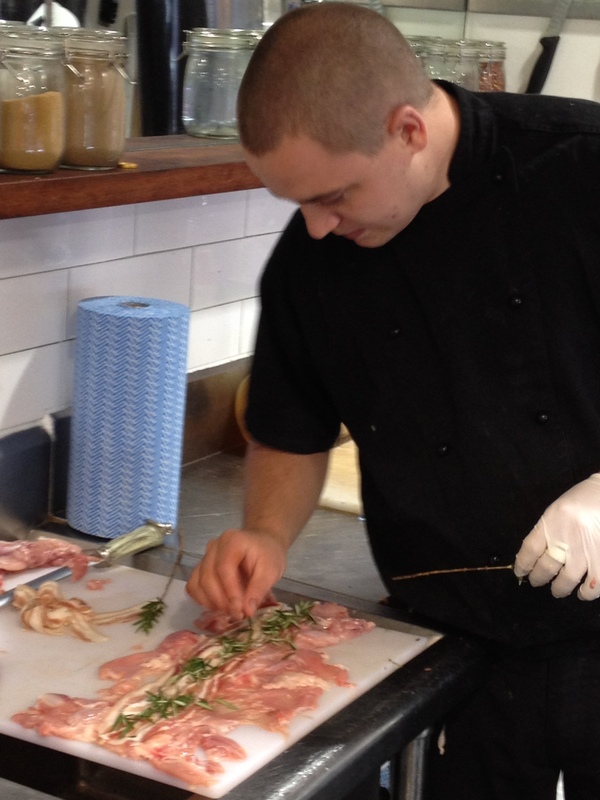 The meat was tender and juicy, and the pancetta and rosemary added a beautiful flavour and the jus was exquisite. Tom mentioned last time he recommended this recipe to a customer, the next time they returned they bought 3 more rabbits and invited him around to enjoy the dish. Well if he keeps this up it could just happen again. So, as mentioned earlier, is eating rabbits too much for some people? Or does it come under the ‘comfortable’ animal slaughter like cattle, sheep and chicken etc? Does anyone have any rabbit recipes that they love? What about suggestions for meats or requests for subjects for me to cover? I had a long phone conversation with a friend of mine this week, generally, about the topic of vegetarianism as it intrigues me and I am writing about it to post at some stage in the near future. I’ll endeavour to cover why people do it, and nutritionally how living this way differs to eating meat regularly and where (in my opinion) the pitfalls lie in being a vegetarian and of course the opinions of people who research in this field and know the answers. But please feel free to suggest other topics and I’ll try my best to deliver, as well as keeping the charming meat chronicles coming. where I’ll keep updating you with what I’m reading regarding training and health and of course meat! Please send this to your friends and colleagues, I want to build a community on here so we can interact and create an open forum on all things training, health and food. Get involved!